The Column Chooser button in both Professional and EDP displays a drop-down list containing a button for each of the Column Chooser functions. Click Open Dialog to open the Column Chooser interface, which shows a list of columns for which visibility can be changed manually, as in the DT_FACILITY example below. 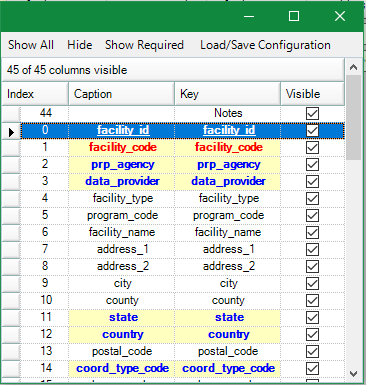 Note: The Caption and Key fields are displayed to minimize confusion if custom captions have been applied to data fields. Click AutoFit Column Width (Quick) to automatically resize each column to fit date in the first 300 rows. This setting is persistent between tables and sessions of EQuIS Professional. This option cannot be used with the AutoFit Column Width (All) option. Click AutoFit Column Width (All) to automatically resize each column to fit all the data in a table. This setting is persistent between tables and sessions of EQuIS Professional. The calculations to resize each column will happen in the background and the status will appear on the status menu in Professional. The process can be canceled by unchecking the option. This option cannot be used with the AutoFit Column Width (Quick) option.